I’m easy to find gifts for! Just buy me some Fiesta (or some other pottery, porcelain, crystal or glassware I collect) and I’m happy. For Christmas one year, Jamey’s mother gave me a Fiesta Hostess Set in Scarlet. 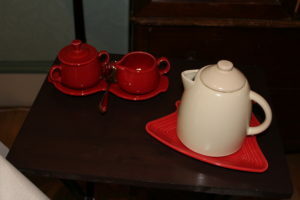 The set consists of a milk jug and covered sugar bowl on a figure-8 tray. I love this set! It’s attractive and easy to handle. I also have the hostess set in white, periwinkle blue, P86 cobalt and P86 yellow. What fun it will be to mix and match the different pieces in table settings!